Before you take your new AR-15 out for target practice or into the field to do some hunting, the first thing you will need to do is zero in the iron-sights. All rifles and upper halves with sights installed from the factory are bore sighted to 25 yards. The process takes some patience, but you will be spending valuable time getting to know your new rifle while making it as accurate as possible. 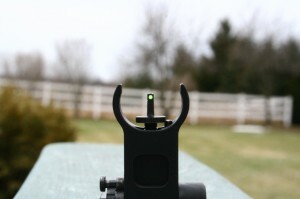 This article focuses on most flip-up and stationary sights. Sighting in with the carry handle is a bit more complicated.